In the month of August, 2013, UAE Exchange Bahrain received the Best Money Exchanger Bahrain award for the year, by the Global Banking & Finance Review. The award was based on the innovation, achievement, strategy, progressive and inspirational changes the organisation brought towards the financial sector. With more than 18 brands in the same category from the Kingdom of Bahrain and most of them contesting, it was a proud moment when UAE Exchange Bahrain received the award. Started 6 years ago, UAE Exchange has over 13 branches in the Kingdom of Bahrain today. Customer convenience has been foremost aspect in the UAE Exchange preamble. Every new development in terms of services, products and even branch location is planned strategically to achieve this aim. Customers can avail from a wide range of services including, Bank Credit, Instant Money Transfer, Bill Payments and Loyalty Programme. UAE Exchange is the first exchange house, in the Kingdom of Bahrain, to qualify and receive the ISO 9001:2008 certification for maintaining best quality management systems and standards, across the various functionalities. UAE Exchange is synonymous with money transfer and has earned the privilege of being the first name that comes to mind for customers when they think of money transfer. The leading global remittance and foreign exchange brand has a rich history of over three decades. Established in 1980 with a single branch in Abu Dhabi, UAE Exchange has now presence over 30 countries in five continents (Africa, America, Europe, Asia and Australia) with over 700 direct offices. 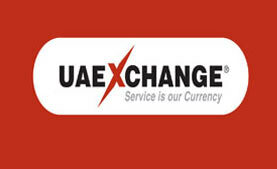 UAE Exchange offers a wide range of services, which makes life easy for millions of customers daily. Every day, more than 9000 employees representing over 40 nationalities, across the globe, strive towards one single aim – customer service and delight! Strong correspondent relationship with over 150 global banks further adds to the might. This penchant for quality has won the ISO certified brand many global awards for quality & business excellence, and earned the trust of customers, partners and regulators alike, thus emerging into the World’s Trusted Money Transferrer. The remittance major offers a wide range of services, which includes Remittance, Foreign Exchange, Payroll Management, Bill Payments, Wealth Management, Travel and Tours and more. Various pro-active processes like SMS intimation, dynamic customer inquiry system, touch points, self operated kiosks, customer suggestions programme, in-house reliable technological initiatives and the trained multi-cultural service staff members, make customers’ every visit, to any of the widely-networked branches of UAE Exchange, a memorable experience. UAE Exchange serves a wide range of communities and cultures, worldwide. The incessant efforts to deliver the best to customers, have earned UAE Exchange the acclaim of being the World’s Trusted Money Transferrer.